What's Rebecca Reading? : Judging books by the ‘frock’ on the cover. This post is going to have very little of me talking about what’s inside the books, but just a quick look at what’s on the outside. It struck me today as I was putting some books away that there are a LOT of books with great frocks on the front cover, so I did a bit of browsing, both the shelves and the world wide web, and it seems to be the very thing to have on the front cover at the moment. It seems to be the cover of choice for a variety of genres, fantasy, paranormal, historical and romance. While I haven't read all of the books (and this is just a small selection! ), I would pick them up simply because they have great covers. 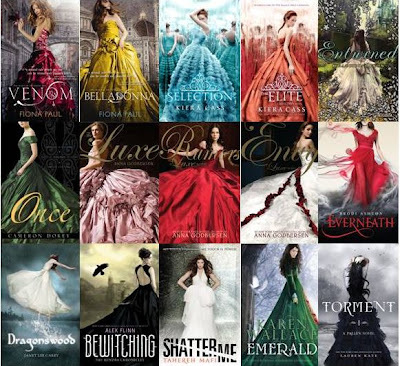 I have admitted already that I am a sucker for a good cover, and I have even read one of the books listed below...because I liked the dress on the cover! I agree. Every time I turned Selection face out on the shelf, I sold it !